Sergio "Maravilla" Martinez captured the WBC and WBO Middleweight Championship with a brilliant performance against Kelly "The Ghost" Pavlik. Official scores were 115-111, 116-111 and 115-112 all in favor of Martinez. Martinez, 35, attended the post fight press conference, although Pavlik, 28, was taken to a nearby hospital due to the severe cuts he suffered in the bout. Unofficially, Martinez entered the ring at 167 lbs., while Pavlik entered at 178 lbs. Previously, both men weighed 159 1/2 lbs. at Friday's weigh-in. "It's always very bad to lose a lot of weight," said Martinez. The weight factor was not an issue tonight; The fighter that won displayed the superior skills. Martinez started boxing at a fast pace in round one, striking Pavlik with a solid right jab. Pavlik sustained a cut above his left eye, and only landed one clean right hand in the round. Pavlik pressed the action in round two, but Martinez kept hitting him with flush left hands and was beating him to the punch consistently with an accurate right jab. In round three, a bloody Pavlik started to close the gap by repeatedly connecting with straight right hands. Martinez would come back strong in the fourth round, however, stunning Pavlik with consecutive lefts after wobbling him with a big right hook. Pavlik took over the fifth round by being first with his shots, and continued to score with right hands in the sixth round. Pavlik put Martinez down with a swift right hand shot in round seven. Yet, Martinez recovered quickly and started countering Pavlik's punches with his right jab. Toward the end of the round, Pavlik nailed Martinez with a thunderous right. In the eighth round, Pavlik caught Martinez with a short right as Martinez was against the ropes. Next, Pavlik landed a right to Martinez's body followed by a right uppercut to his head. Pavlik was doing a superb job of keeping his left foot on the outside of Martinez's right foot, which enabled him to hit Martinez and limit getting caught by a counter punch. From rounds nine through twelve, Martinez controlled the entire fight, beating Pavlik to a bloody pulp. Martinez peppered Pavlik continuously with straight lefts and stinging right hooks. Martinez was easily able to move in and out of range without Pavlik laying a glove on him. Throughout rounds ten - twelve, Martinez kept his pace up, assaulting Pavlik with unanswered right hooks and straight lefts. He struck Pavlik at various angles, which kept Pavlik from effectively countering. After the bout, Martinez had a great deal of swelling under his right eye, but it was nothing compared to the damage he inflicted on Pavlik. "I didn't think this was a bad Kelly Pavlik. 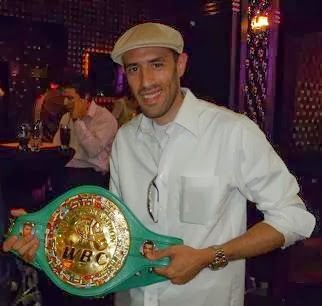 I think he beat a really good Kelly Pavlik," said Lou Dibella at the post fight press conference. "I think if he moved up to 168 lbs., he could dominate." There is a rematch clause in the contract. "If they want it, they'll have it," stated Dibella when asked about an immediate rematch. "We just stopped punching from rounds nine through twelve," stated Pavlik's trainer, Jack Leow. "It's not the end of the world. We lost a fight." "After the ninth round, we needed to push to win the fight," stated Martinez. "To be champion, you need to push the last three or four rounds. I fought with the king of the middleweights and won." Not only was the win over Pavlik a great victory for Martinez, but for the people in his native Argentina as well. "Being in boxing and being a boxer gives you a chance to dream about a day like today," said Martinez. "This is the dream of every boxer. And today, I accomplished my dream." Vincent Arroyo (10-1, 7 KO’s) upset previously unbeaten Jeremy Bryan (13-1, 6 KO’s) by notching an eighth round knockout in a junior welterweight match-up. Both men started firing fast jabs and used a lot of feints to begin the fight. Bryan landed a flush, double left jab-right hand combination, although Arroyo was not seriously hurt. In round two, Arroyo, 22, had trouble getting his punches off before Bryan. Bryan was busy and accurate, scoring with four punch combinations. Bryan, 24, opened the third round by connecting with a left-right-left uppercut combination. Arroyo responded with a right, but Bryan fired a counter left hook. As Arroyo’s back was against the ropes, Bryan landed a left hook to the body and a crisp right hand to the head. Arroyo’s minimal punch output enabled Bryan to fight at a quicker pace and land more shots. In the fourth round, Bryan caught Arroyo with a vicious right uppercut as Arroyo rushed toward him. Next, Arroyo landed a left hook, but Bryan unleashed a right-left hook combination. Then, Bryan missed a left hook, although he hammered Arroyo with an ensuing flush right. Bryan easily controlled the tempo of the first four rounds, however, Arroyo started to take over in the fifth round. After Bryan connected with an overhand right as Arroyo lay on the ropes, Arroyo landed a massive left hook to Bryan’s head. Arroyo went after a stunned Bryan, landing a powerful left hook to his body. Yet, Bryan recovered and started to utilize his left jab. After that, Bryan scored with a right to the body, but Arroyo struck him with a left uppercut-overhand right combination. The sixth round was very spirited as both men battled fiercely. Arroyo pressed the action, connecting with a clean right hand and followed it with a left hook. Next, Bryan nailed Arroyo with an overhand right, but was hit low by Arroyo after the exchange. Then, Bryan aggressively attacked Arroyo and landed a flush overhand right. Bryan successfully landed a counter left hook, but was hit low again in the seventh round. After that, Bryan knocked out Arroyo’s mouthpiece with a devastating left hook. Following that heated exchange, Bryan momentarily wobbled Arroyo with right-left hook combination. In the eighth round, a big right hand by Arroyo impaired Bryan. Arroyo went after him, and connected with a left hook followed by a flurry of punches. Bryan was badly hurt and against the ropes when Arroyo opened up an arsenal of damaging left uppercuts, left hooks and a hard right hand. Then, Bryan slipped to the canvas and was counted out. From press row, it appeared Bryan was pinned against the bottom rope when Arroyo delivered the final blows. If Bryan’s right knee was down when Arroyo landed his punches, which Bryan’s corner adamantly claimed, the fight would have been declared a disqualification. However, there was no ruling by referee Samuel Viruet that Bryan’s knee was down at the time Arroyo threw and landed his punches. Therefore, Arroyo won by knockout in round eight at 1:43. Welterweight contender Mike Jones (21-0, 17 KO's) remained undefeated, impressively stopping a durable Hector Munoz (18-3-1, 11 KO's) in the fifth round. Jones landed a series of rights to the body and head of Munoz. Then, Jones sent Munoz into the ropes after connecting with a sharp left hook. In round two, Jones frequently connected with sharp punches and snapped Munoz’s head back with a vicious right uppercut. Munoz, 31, was unable to compete with the hand speed of Jones. As a result, Jones repeatedly landed blistering punches. Munoz was stunned by an overhand right in round three. After that, Jones sent blood flying out of Munoz’s mouth when he rocked him with a right uppercut in the fourth round. Munoz, who was already hurt by a jab-right-double left hook combination from Jones, absorbed an overhand right that sent him staggering into the ropes in round five. Finally, referee Benjy Esteves Jr. stopped the bout when Jones landed another overhand right. The official time of the stoppage was 2:03. After this amazing performance, Jones appears ready to battle the elite in the welterweight division. In heavyweight action, Dominick Guinn (33-6-1, 21 KO’s) forced Terrell Nelson (8-10, 5 KO’s) to quit after seven rounds. At times, Guinn looked lackluster, but hurt Nelson with several left hooks and right hands to the head. Junior welterweight Chris Hazimihalis (2-0, 2 KO’s) stopped Ramon Ellis (0-5, 0 KO’s) at 1:28 of round one. Hazimihalis landed a counter right to the temple of Ellis. Then, he unleashed a barrage of punches as Ellis was trapped in the corner. In a junior middleweight bout, Ronald Hearns (24-1, 9 KO’s) kayoed Delray Raines (17-8-1, 12 KO’s) at 1:47 of the first round. First, Hearns connected with a counter right that floored Raines. Raines got up, but his legs were shaky. Then, Hearns put Raines down on the canvas for several minutes after landing a ferocious right hand. Glenn Tapia (6-0, 4 KO’s) defeated James Winchester (10-4, 3 KO’s) by a four round unanimous decision in a junior middleweight bout. Tapia frequently connected with overhand rights, and put Winchester down with a rock-solid left hook to the head in round two. Official scores were 40-35 on all three judges’ scorecards. Matt Korobov (11-0, 8 KO’s) remained unbeaten, scoring an eight round unanimous decision over a resilient Josh Snyder (8-5-1, 3 KO’s) in a middleweight clash. Official scores were 79-73 and 78-74 twice. Korobov, a 27-year-old southpaw, used many angles and beat Snyder, 30, to the punch with straight lefts and right hooks in the opening round. In round two, Korobov sent Snyder stumbling into the ropes after landing three consecutive straight lefts. Then, Korobov hurt Snyder with a right hook to the head. Korobov continued his assault on Snyder in the third round, landing a counter straight left and followed up with a left-right to the body. However, Snyder came on strong in the fourth round, nailing Korobov with a right to the head. Then, Snyder scored with a left hook to the body. Korobov countered with consecutive right hooks, and landed a vicious left to the body. Snyder fought admirably in close range and landed a solid right uppercut, but Korobov immediately responded with a counter right hook to the body. Snyder really stepped up his punch output in the round. Korobov seemed very fatigued in round five. Snyder pressed the action and attacked Korobov’s body and head. In round six, Korobov attacked Snyder’s body with a series of lefts and rights. Round seven was highly competitive as Snyder forced the action by throwing a barrage of body and head shots. Korobov was not as busy, although he repeatedly placed his punches with extreme accuracy. Korobov, who is a heavier puncher than Snyder, ripped a right to the body and followed it with a right uppercut-straight left combination. Then, Korobov landed a hard straight left. Yet, Snyder kept punching and coming forward. Korobov looked a bit tired, but finished convincingly. Snyder proved to be an incredibly formidable opponent.